Just like many other Canadians, Tim Horton’s Iced Cappuccino is one of the drinks we enjoy in summer (sometimes even in fall & winter). One day while brainstorming what we should experiment next in our Blendtec Blenders, we thought of Googling Tim’s Iced Cappuccino recipe. To our surprise we came across a recipe that actually comes pretty close to the actual beverage. Bring water to boil and add it to the mug with instant coffee and sugar. Stir well. 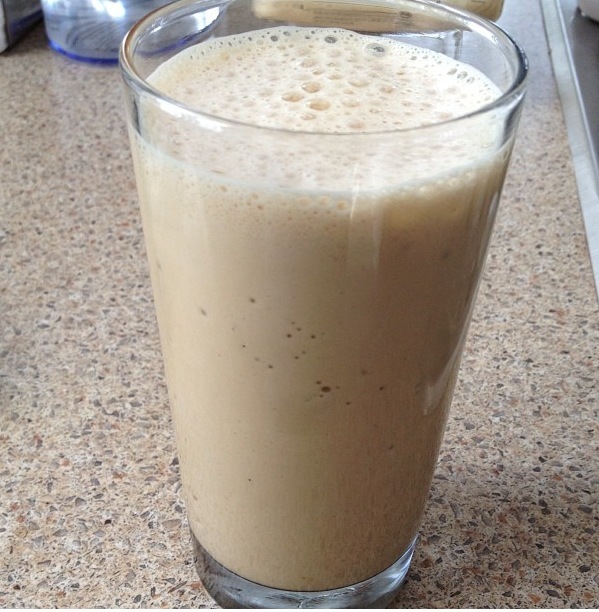 Pour the syrup into the blender along with ice and blend until it becomes slushy. Lastly, add whipping cream and blend for several seconds until the drink becomes frothy. It’s been a while since we last made it, but our guess is it at least yields 2 glasses of Iced Cappuccino. Categories: Recipes | Tags: beverage, blendtec blenders, drink, Halal Food, Halal Food Recipe, Homemade, iced cap, iced cappuccino, iced cappuccino recipe, iced coffee, instant coffee, tim horton, tim horton's, tims | Permalink. 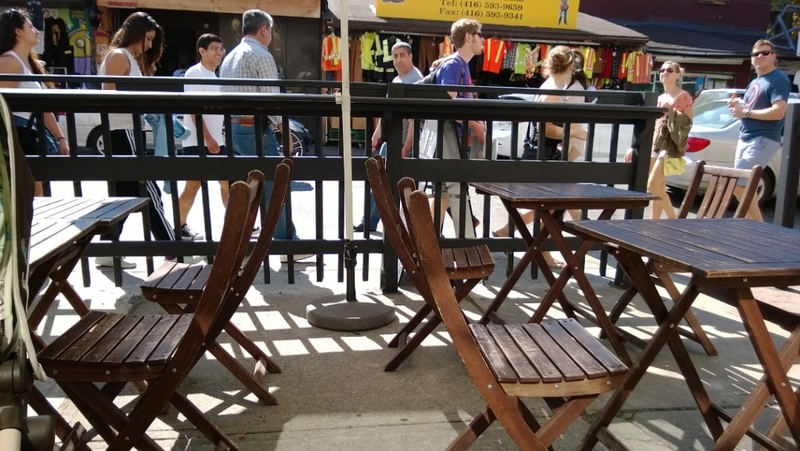 We are a regular at Paramount Fine Foods and enjoy a variety of their menu items. 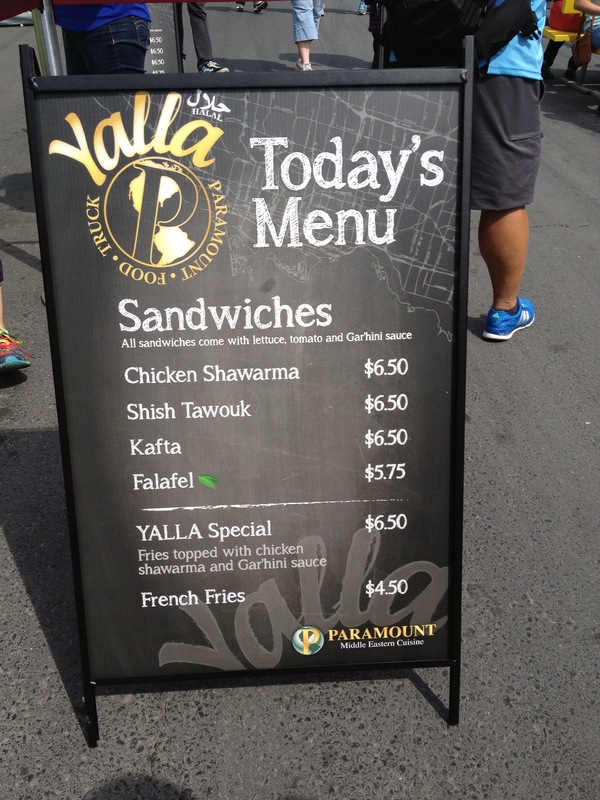 Yalla Paramount has some of the regular items, but Yalla Special is something that hasn’t been offered at Paramount restaurants, so we were very excited to try it. We were under the impression that it would be fries with chicken and seasoning, but it wasn’t just any plain/bland chicken, it was Paramount’s shawarma chicken that went really well with the fries! Of course their garlic sauce along with a mixture of other seasonings made Yalla Special a winner! If you happen to enjoy fries (yes deep fried goodness) and Paramount’s shawarma chicken (also fried) and their signature sauces, then you have to try it out. Oh, we did receive two $5 off (at Paramount Fine Foods restaurants) coupons as well, which really sweetened the deal for us. We also ordered Shish Taouk Sandwich, which lived up to expectations. We’ve had it in the past at Paramount and it turned out just as delicious and filling. Categories: Restaurant Reviews | Tags: paramount, paramount fine foods, paramount special, shawarma, shish taouk, wrap, yalla paramount | Permalink. We’ve always enjoyed funnel cakes at amusement parks, exhibitions and festivals. There are some restaurants that have started offering funnel cake. We were tempted to find a recipe that can yield exceptional results at home, so that we can enjoy funnel cakes at home (whenever we are craving them). We’ve tried several recipes from Ikhlas Hussain’s blog The Whimsical Whims of Ikhlas Hussain in the past with great results and had no hesitation trying this recipe of hers. The funnel cake turned out delicious beyond words! One of us sisters described it as “perfect”. Yes, that is how good it was. Best of all, the recipe was very simple to follow and it was easy to make. We definitely recommend you guys to try it out! You will not be disappointed. 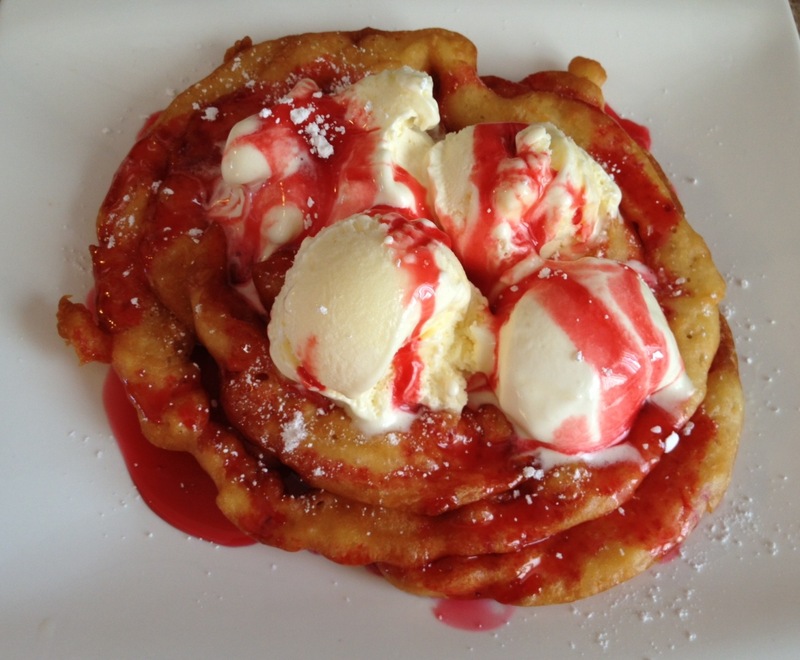 Please visit the following URL for the recipe: Strawberry Topped Mini Funnel Cakes. Categories: Recipes | Tags: dessert, funnel cake, Ice Cream, strawberry, sweet | Permalink. If there is one thing that you should know about us sisters and it is that we have a really, really big sweet tooth. We love all things sweet. 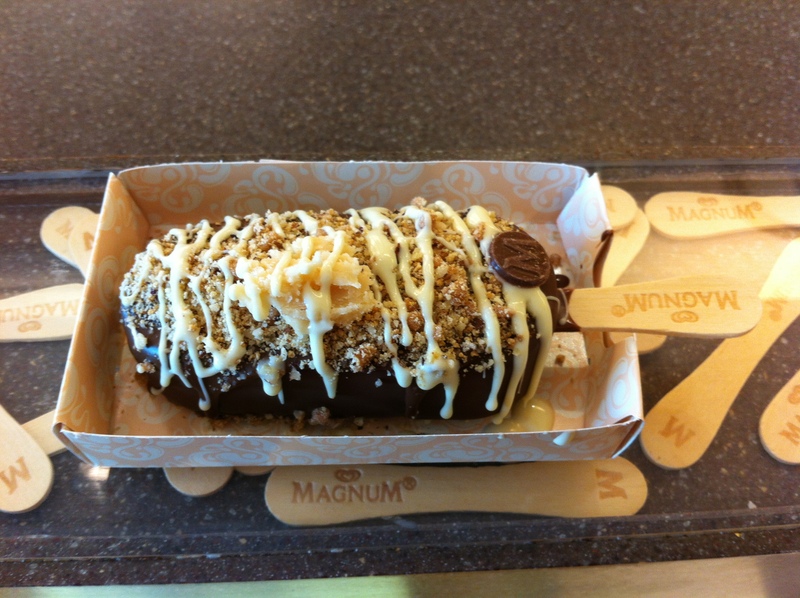 If you happen to live in Toronto, then there is no doubt in our minds that you have heard about the Magnum store hype. Initially we were a little ‘meh’ about the hype since we aren’t huge fans of Magnum ice cream. 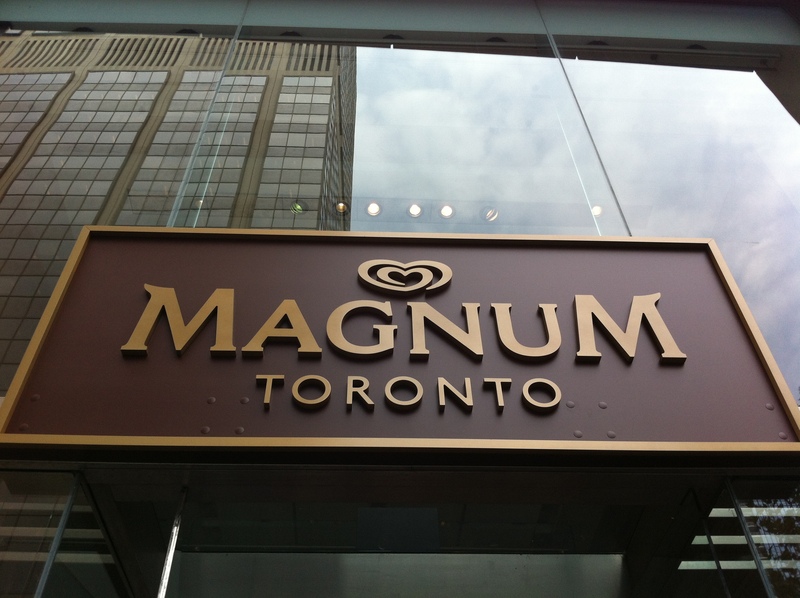 However, one fine day we decided to drop by the Magnum Pleasure store on 11 Bloor Street West to check out what all the buzz was about. The store was quite fancy with nice decor, fancy lighting and greeters at the entrance. All the fancy, shamncy stuff aside, we were here for ice cream. 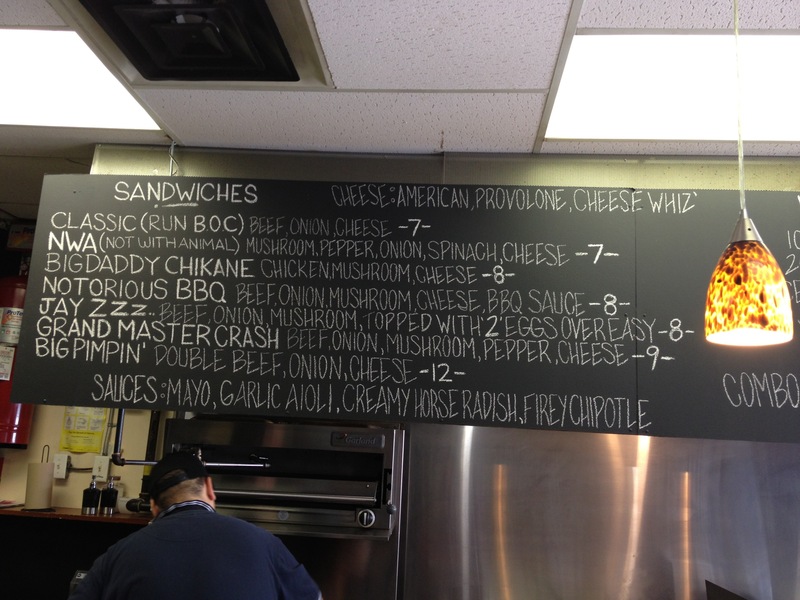 We quickly glanced over the ordering procedure and went up to counter to order. Step 1: Pick an ice cream flavour (vanilla or chocolate) — We got vanilla. Step 2: Coat it (white chocolate, milk chocolate or dark chocolate)— We got milk chocolate. Step 3: Top it — This was the fun part. There were loads of toppings to choose from that ranged from hazelnuts to rose petals to chilli flakes. Please note that all the toppings may not be halal so you will need to pick and choose. We wanted to keep it simple so we got toffee bits, hazelnuts, and Canadian maple fudge. It was a very safe combination but one that we knew would taste good. 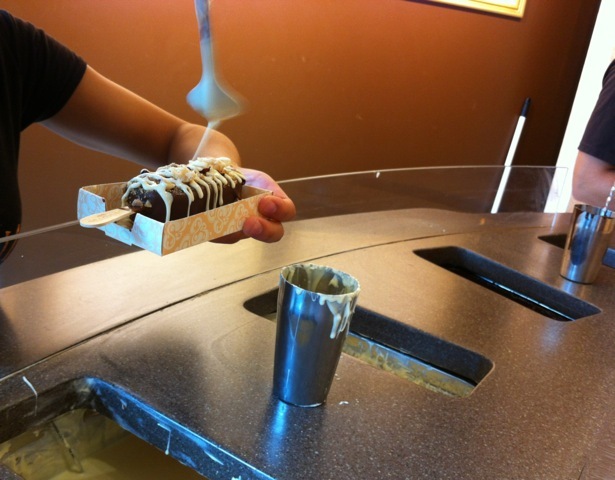 Step 3: Drizzle it — We chose white chocolate drizzle. Step 4: Set it – They let the ice cream set for a while. We kid you not, this was pretty darn awesome! It was really om nom nom worthy. It was a little messy to eat but hey, we just grabbed some napkins and enjoyed it. Since we went on a weekday, there was no line up at all. For $6 (including taxes) this was a pretty good deal. There are only a few days before this store closes so make you guys check it out! The last day is August 30th. Categories: Product Reviews, Restaurant Reviews | Tags: Bloor Street, dessert, GTA, Ice Cream, Magnum Ice Cream, Magnum Pleasure Store, Magnum Pleasure Store Toronto, Toronto | Permalink. 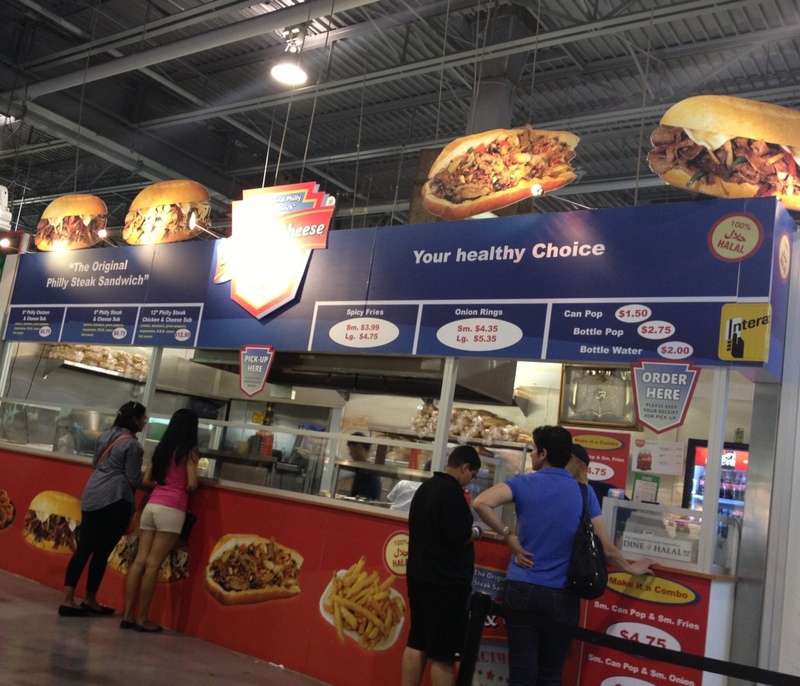 We’ve been to CNE several times in the past, but for some reason never paid too much attention to food. Instead, we spent most of our time enjoying other attractions. This year we were looking to try out halal food options at CNE and read through the CNE food guide to determine what can be enjoyed. Today happened to be a good day to visit CNE, especially because the weather was good (neither too hot, nor too cold and no precipitation). Though we were very excited about trying food items/vendors that we haven’t tried in the past, our goal was to really try a few things and not over indulge. After all, it is all going in our stomach and we didn’t want to make it unpleasant for ourselves. Our first stop was Wild Child’s Kitchen (100% vegetarian & vegan) inside the Food Court. Compared to many other vendors, Wild Child’s Kitchen was fairly busy. It had a very crisp and clean ambiance, which was inviting. We decided to settle for Nacho Rama. We were a little skeptical since it’s vegan, but we were positively surprised by how light and refreshing it tasted. 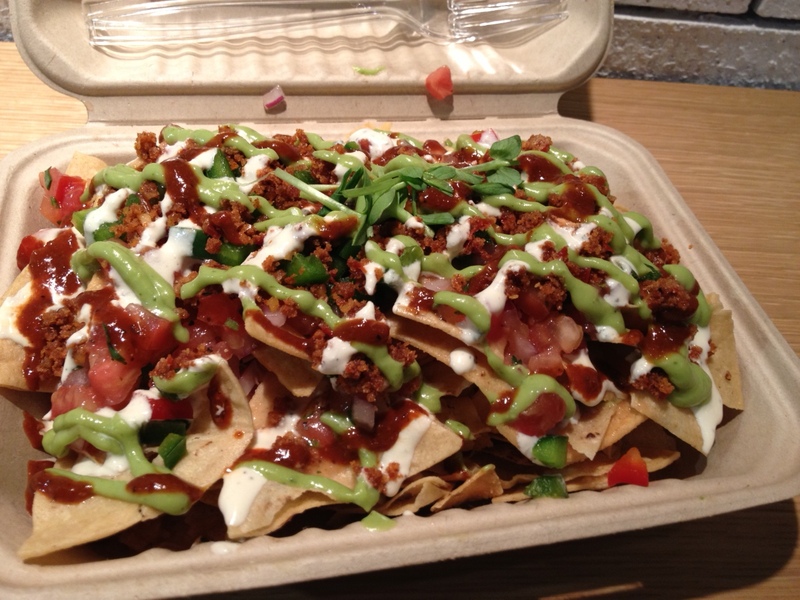 The various sauces complimented the nachos well and left us feeling light and fresh. 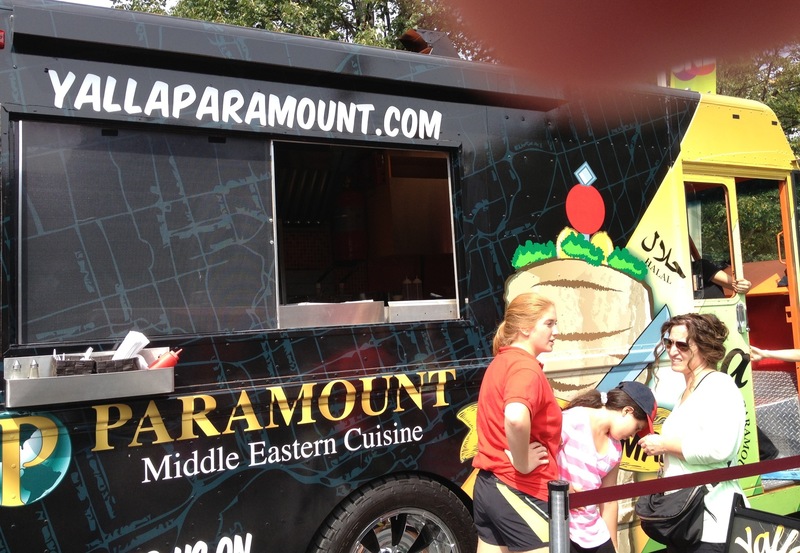 Next up, our main attraction was Yalla Paramount (food truck). 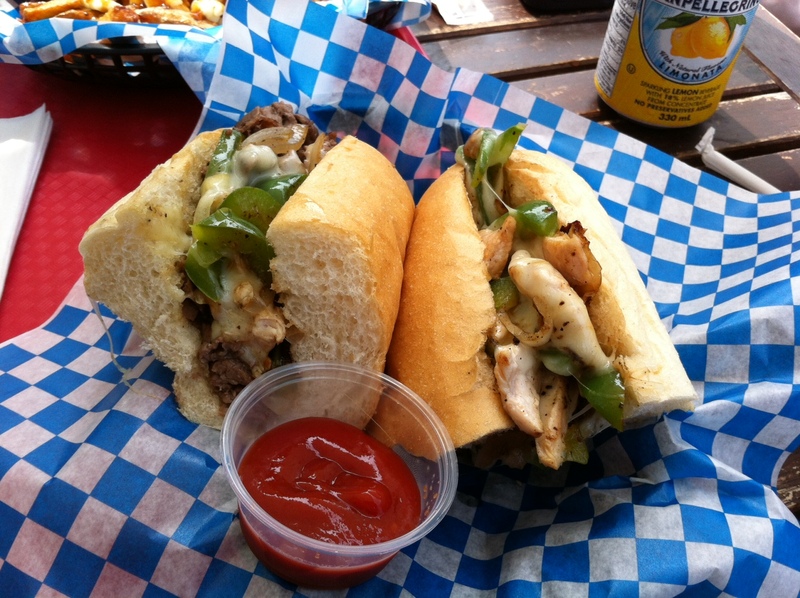 This is one food truck we had been waiting to try ever since we heard about it! We made our way from the Food Court to the food trucks, which provided us with enough time to be ready for our next food adventure. By now we were full and fairly satisfied with our food escapades. 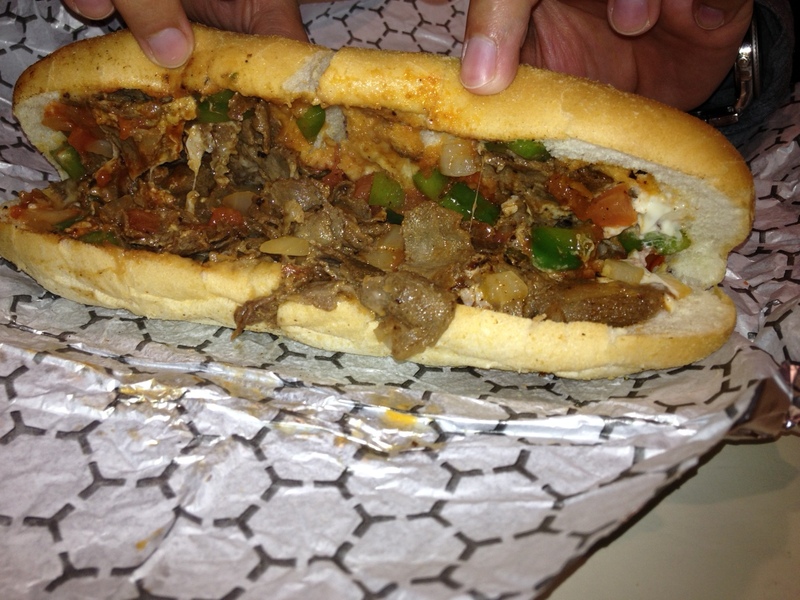 However, since we’ve never had Steak & Cheese Factory’s philly steak, we decided to slightly over-indulge. We ordered 8″ Philly Steak & Cheese. 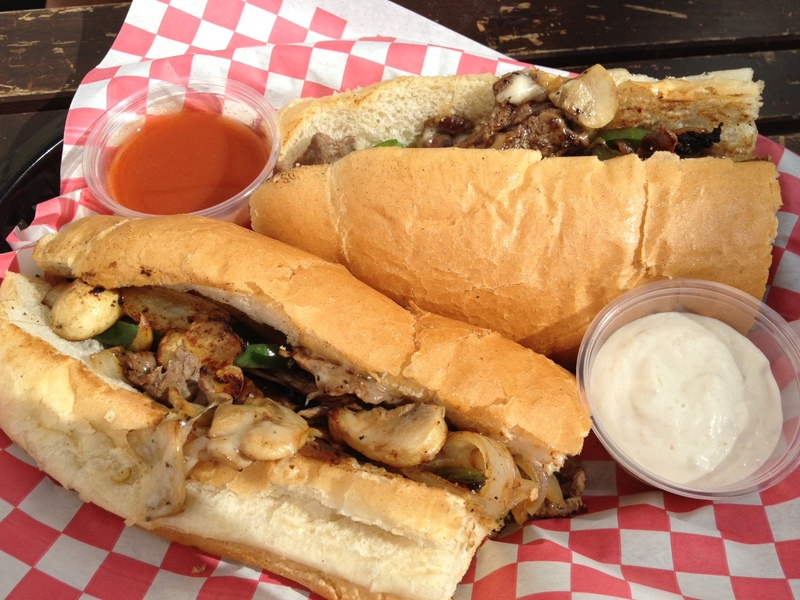 BBQ sauce and hot sauce were interesting additions to the philly steak. It was a fairly standard philly steak, nothing gourmet about it. We decided to primarily stick with water and the aforementioned food items we tried didn’t leave much space for any dessert or drinks. We left feeling satiated and happy. We were very happy to see, literally a plethora of halal food options (particularly halal meat). We look forward to visiting CNE again to try food, drinks and desserts from other vendors offering halal choices. CNE frequently exhorts fairgoers to take public transit; however, we decided to drive. We were in a shock to learn that CNE parking on a Sunday was $30. Next year, we plan on taking public transit. We noticed both GO Train, TTC buses and streetcars drop you right outside of The Ex, requiring no additional walking. We hope you have just as good of a time at The Ex as we did, if not better! Categories: Restaurant Reviews | Tags: Canadian National Exhibition, cne, Halal, Halal Food, Halal Food CNE, Halal Food Review, Halal food toronto, Halal Restaurant, nacho rama, nachos, North American Food, paramount, paramount fine foods, philly steak, the ex, Toronto, wild child's kitchen, yalla paramount | Permalink. Did we ever mention we love deep fried halal goodness? If we haven’t, well here we are proclaiming our love for fried halal food. We were sad to see most of Popeye’s locations close down across the GTA. Thankfully, we were happy to see old Popeye’s locations slowly turn into Dave’s Chicken & Seafood restaurants. 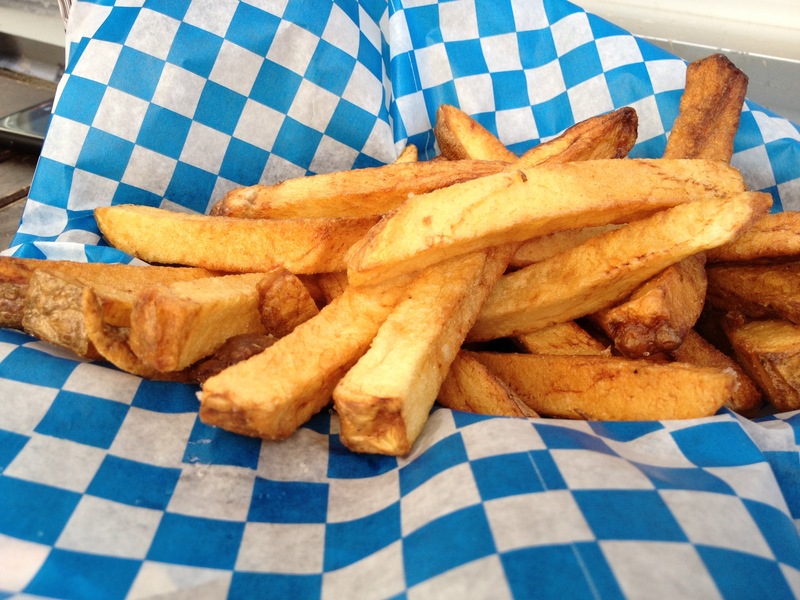 We first learned about them at Toronto’s Halal Food Fest 2012; however, we only got a small taste of it at Halal Food Fest. In Ramadan we learned that Heartland (Mississauga) Popeye’s has turned into Dave’s Chicken & Seafood. Naturally, we decided to try out a couple of items from their menu. Since it was Ramadan, we decided to take-out close to iftaar time. We ordered a couple of Hot Chicken Sandwich(es) and Chicken Xtreme Poutine. The Hot Chicken Sandwich had a slightly different taste, but it was very close to Popeye’s Chicken Sandwich. In fact, it was very good. As we worked towards finishing our sandwiches, we realized the sandwiches may just be bigger in size or at least they appeared to be more filling than Popeye’s sandwich. We loved the hot mayo that was used; it certainly gave the sandwich a good strong kick! Since we are huge poutine fans and were excited to see poutine, we decided to order Chicken Xtreme Poutine as opposed to their regular poutine. 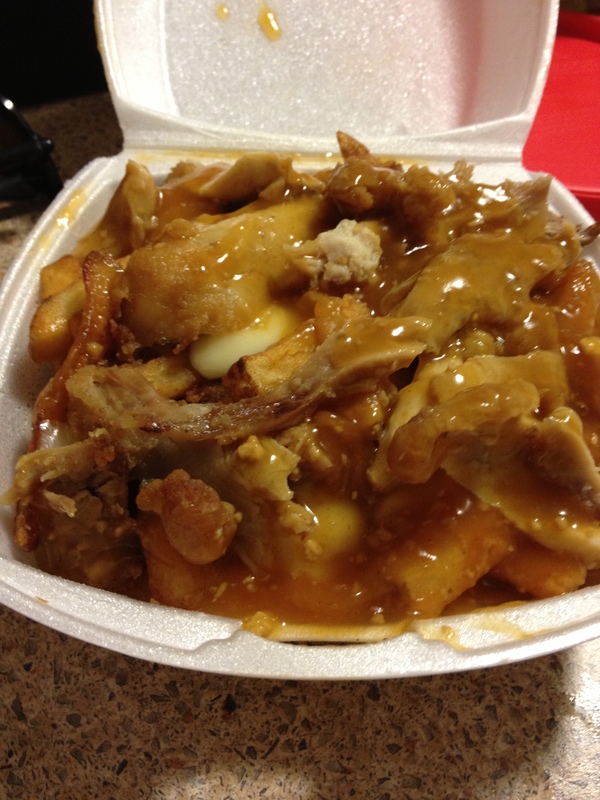 We enjoyed the fries, gravy and cheese, but were a bit disappointed in the fried chicken that topped the poutine. 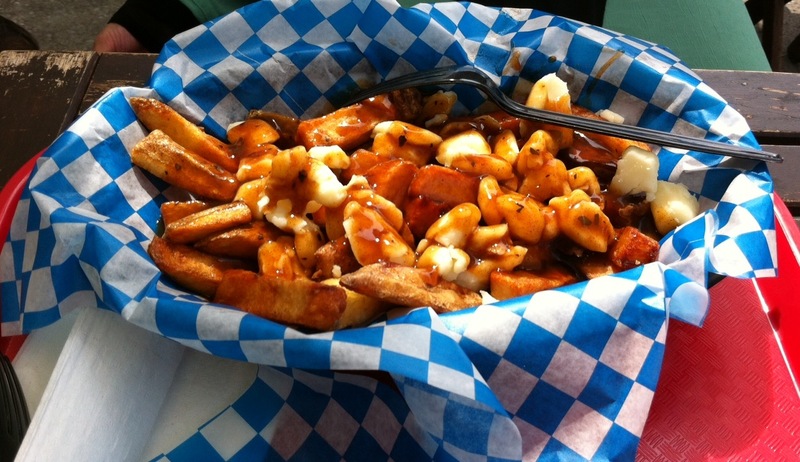 We do plan on ordering poutine again from their menu, but would like to try their regular poutine next time. The fried chicken appeared to be pulled-chicken from their chicken drumsticks. Gotta say, if we had to decide between the fried chicken in their sandwich and fried chicken drumsticks, we will likely opt for the sandwich, as the latter seemed a little bland compared to the chicken in the sandwich. The cheese curds were a nice change and gave the poutine a good strong cheesy and rich taste. It was good to see cheese curds after a long time, as we’ve noticed that many halal poutine vendors tend to use frozen shredded cheese, which sort of does injustice to the poutine. 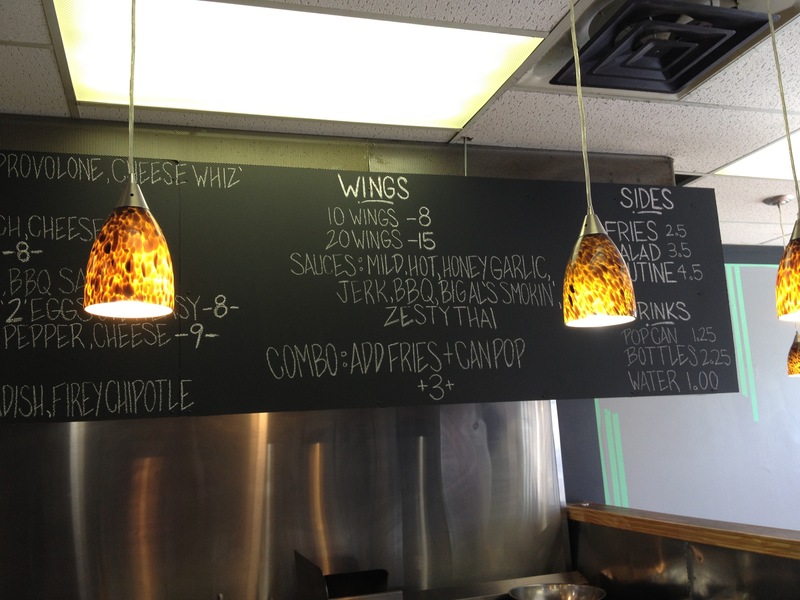 We look forward to returning and trying out other items on their menu as well. Categories: Restaurant Reviews | Tags: chicken sandwich, chicken xtreme poutine, dave's chicken, dave's chicken & seafood, dave's chicken and seafood, fried chicken, Halal, Halal Food, Halal Food Review, Halal food toronto, Halal Restaurant, heartland, heartland mississauga, matheson blvd, Mississauga, North American Food, popeye's, popeye's chicken, spicy chicken sandwich, Toronto | Permalink. So one of us sisters is a fan of Japanese food, whilst the other isn’t. Since we’re always looking to try new restaurants and willing to take let our palates try something new, we decided to venture off to Zem One, halal Japanese restaurant in Mississauga. With time we did learn that a conventional Japanese restaurant tends to use alcohol in their seafood and vegetarian items, so we were excited to try an alcohol-free halal Japanese restaurant. 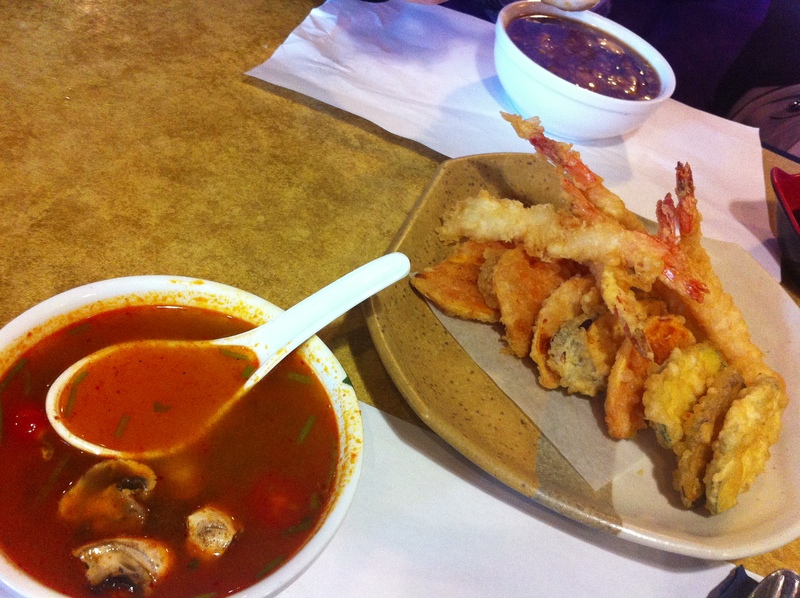 After going through their extensive, yet exciting menu, we decided to order Tom Yum Soup, Hot & Sour Soup, Assorted Tempura (Shrimp & Veg. ), Spicy Dynamite Roll and Pad Thai. Of the two sisters, I’m less enthusiastic about Japanese food, but to my surprise every item that we ordered was superb! 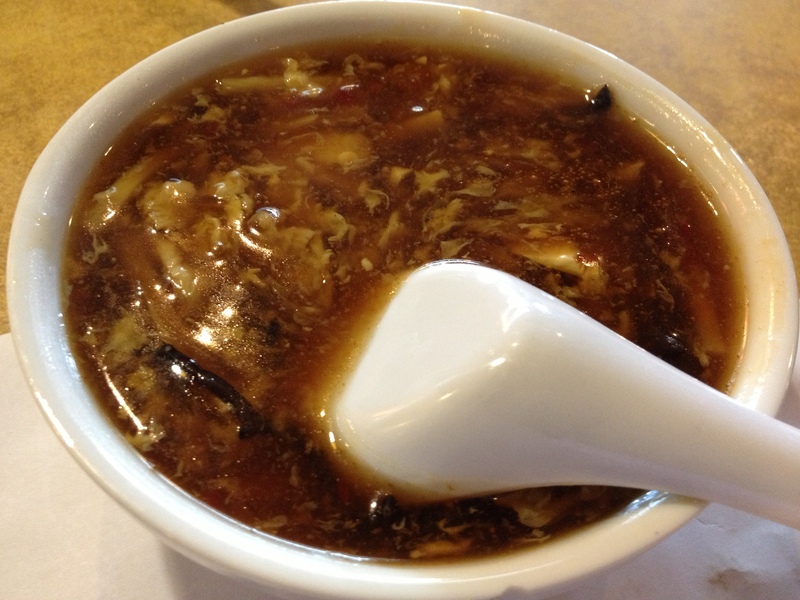 Hot & Sour soup was good, which it usually is at a whole bunch of restaurants; however, Tom Yum soup is usually disappointing at most restaurants. One spoonful of it and I was sold, as was my sister! Both soups were a bit on the salty side but we didn’t mind it. The soups were flavourful and delicious. Next, we tried Assorted Tempura which consisted of deep fried vegetables (eggplant and sweet potato) and shrimp. Tempura is basically vegetables and seafood dipped in batter and deep fried. Since everything deep fried is heavenly good, so was this dish. 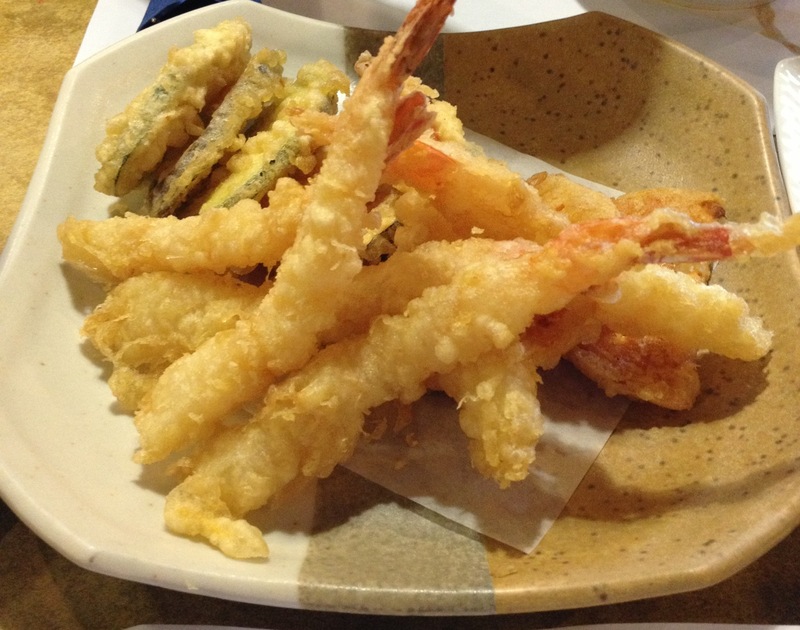 Tempura is usually everyone’s favourite and so it goes fast and we always end up wanting more. It is served with sweet ginger, soy sauce (not pictured here) which is the perfect dipping sauce. We highly recommend ordering this item. 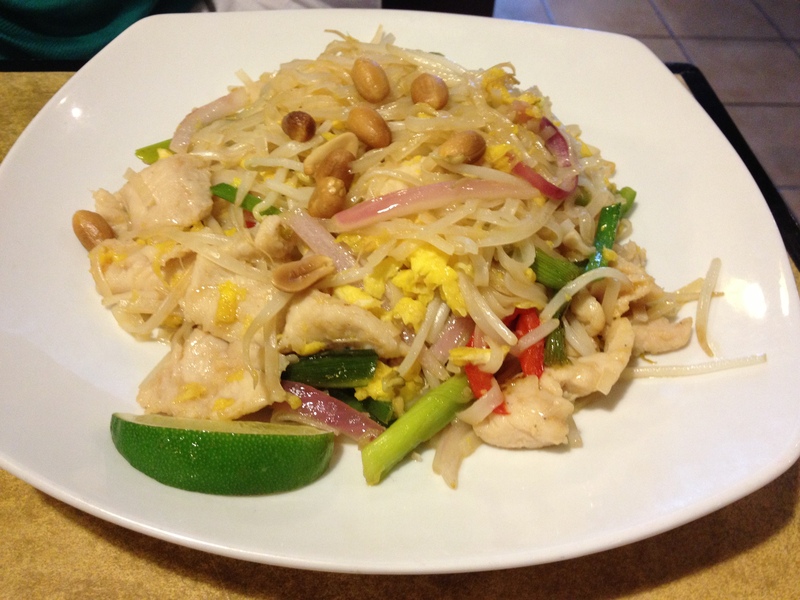 We also tried the Chicken Pad Thai, rice noodles stir fried with egg, bean sprout, and green onions in a tamarind sauce. It was garnished with roasted peanuts and lime. We thought it was a pretty solid pad thai with lots of flavours, textures and crunch. Yum! The last and most nerve wrecking item was Spicy Dynamite Roll (with Shrimp). Since one of us sister’s gets nervous about eating raw fish, this item was the perfect solution. 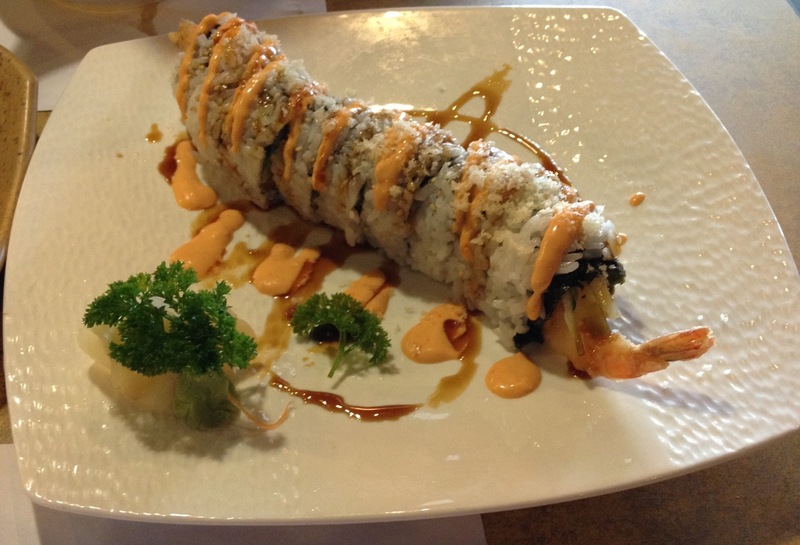 The Spicy Dynamite Roll consists of shrimp tempura (cooked shrimp), cucumer, avocado, crab meat (we weren’t aware crab meat was there; we will request to have it removed next time from the roll), yam tempura with teriyaki sauce, spicy mayo and garlic sauce. This roll was amazing! Although it was packed with lots of ingredients, it was very light and refreshing. It was fairly spicy; however, the avocado and shrimp balanced it out well. This item is a must try! Needless to say, we’ve returned to Zem One and have enjoyed their food. We are both now equally enthusiastic about Zem One’s food and often drive out of our way to visit this restaurant. The decor is quite decent and the restaurant is well maintained. The service has been excellent every time we have visited.They offer All You Can Eat lunch and dinner specials as well. Categories: Restaurant Reviews | Tags: GTA, Halal, Halal Food, Halal Food Review, Halal food toronto, Halal Japanese Food, Halal Restaurant, japanese, Mississauga, one, zem, zem one, zemone | Permalink.